Just as the Bush administration did with the case of Jose Padilla, the Obama DOJ convinces the Supreme Court not to rule on a key constitutional issue. After being held in captivity as an accused "enemy combatant" by the U.S. Government for more than five years without charges or a trial of any kind, Ali Al-Marri -- who was a legal resident in the U.S. and was on U.S. soil at the time of his detention -- was, two weeks ago, finally indicted and charged with various crimes in a federal court. The indictment came as the U.S. Supreme Court was set to rule whether the Constitution allows the President to imprison legal residents inside the U.S. as "enemy combatants" and keep them imprisoned indefinitely with no charges or trial (both sides of the appellate court decision agreed that the legal analysis is the same for the power to imprison U.S. citizens). But now there will be no such ruling, because the Obama administration (over the objections of Al-Marri's ACLU lawyer) successfully convinced the Court to dismiss the case on the ground that the indictment of Al-Marri renders the question "moot." This critical question will thus remain unresolved by the Supreme Court. What just happened in the Al-Marri case is (with one important exception) a virtual repeat of what the U.S. Government (under the Bush administration) did in the Jose Padilla case. The Bush administration arrested Padilla, a U.S. citizen, on U.S. soil; accused him of being an "enemy combatant"; and then imprisoned him for the next three-and-a-half years without charges or a trial of any kind (even without contact with the outside world, including a lawyer). Just as Padilla's case was about to be heard by the U.S. Supreme Court, which was set to rule on whether the Constitution allows a President to order American citizens imprisoned in military brigs with no trial, the Bush DOJ indicted Padilla and then convinced the Supreme Court to refrain from ruling on the issue because Padilla's indictment rendered the question "moot." The critical question thus remained unresolved by the Supreme Court. It doesn't exactly take great powers of observation to see the pattern here. Federal courts are excruciatingly slow. Even when someone's liberty is being unjustly deprived -- i.e., when they're being held in a cage with no trial -- federal judges take their sweet time in issuing rulings: often many, many months -- sometimes longer. Federal judges are guaranteed life tenure; have virtually no oversight or supervision; essentially rule unchallenged over their little fiefdoms; and thus have no real incentive to resolve cases quickly. Some work hard, and many don't. They get to cases when they get to them. Thus, it's virtually certain that it will take a case of this sort several years to wind its way through the various stages of judicial review, all while the detainee sits in prison with no trial. This time factor alone vests the U.S. Government with the power to imprison legal residents or even U.S. citizens with no trial for at least a period of several years, as the detainee's constitutional challenge to the process-less imprisonment slowly winds it way through the federal courts. Before the U.S. Supreme Court can rule on whether that is constitutional, the Government can then finally bring charges against (or simply release) the detainee, and then argue to the Court (apparently, with success) that there is no reason for the Court to rule on the constitutionality of those actions because the case is now "moot." That's what just happened in the Al-Marri case (just like in the Padilla case), and there's no reason why it can't continue to happen that way. The Obama administration absolutely did the right thing in indicting Al-Marri. Continuing to imprison him without charges was an ongoing disgrace. And the Obama administration's consent to have the Supreme Court vacate the Fourth Circuit's horrendous decision upholding this power is commendable (though another Fourth Circuit ruling, in the Padilla case, largely upheld the President's detention powers, and that was left standing by the Supreme Court when it dismissed Padilla's case (and Al-Marri's) and thus remains good law). While the government did not defend its power to detain Mr. Marri at present, it left open the possibility that he or others might be subject to military detention as enemy combatants in the future. “Any future detention — were that hypothetical possibility ever to occur — would require new consideration under then-existing circumstances and procedure,” the Justice Department told the court in a brief filed Wednesday. This action means not only that Obama could imprison legal residents or even American citizens as "enemy combatants," but could even re-declare Al-Marri himself to be an "enemy combatant" if he's acquitted in his trial. It's disturbing that this question remains unresolved particularly given that key Obama appointees -- including Solicitor General Elena Kagan and White House Counsel Gregory Craig -- have openly suggested that, at least with regard to foreign nationals, the "War on Terror" paradigm empowers the President to view the world as a "battlefield" and thus imprison people without charges as "enemy combatants." This action by the Obama administration should also (at least in a rational world) put to rest the painfully sycophantic claim that the only reason the Obama DOJ is embracing radical Bush-era legal positions is because they secretly hope to lose in court and thereby create good judicial precedent. 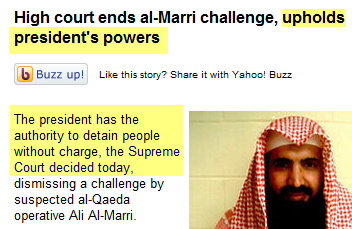 If that were really their secret, noble goal, then they would have urged the U.S. Supreme Court here to rule on Al-Marri's claims (which many legal observers expected would end in Al-Marri's favor) -- not urged the Court to refrain from ruling, thus shielding this asserted power from ultimate judicial scrutiny. There's no reason to assume that the Obama administration intends to exercise the power to imprison legal residents or U.S. citizens without charges, as the Bush administration did. Unless and until they do that, they haven't done it. And with Al-Marri's indictment, there are now no U.S. citizens or legal residents being held as "enemy combatants," so that's an important step. But, for obvious reasons, it is both unjust and dangerous to preserve this power by engaging in maneuvers (whether intended or not) to block the Supreme Court from finally ruling on the constitutionality of this ultimately tyrannical weapon. Thus far, in the realm of the Constitution and civil liberties, the primary attribute of the Obama administration is to do everything in its power to protect and preserve the President's ability to assert the radical powers invented and seized by the Bush administration, independent of whether they actually intend to use those powers at some point. The president is very sympathetic to those who want to find out what happened. But he is also mindful as president of the United States not to do anything that would undermine or weaken the institution of the presidency. There is, of course, no real way to reverse the radically expanded powers of the executive without taking steps to "undermine or weaken the institution of the presidency" -- exactly that which Craig expressly vowed Obama would not do. So far, they seem to be adhering quite faithfully to that strange vow. It would be a rather significant news event if the Supreme Court had, in fact, decided that the President "has the authority to detain people without charge," though I suppose it's a sign of the times that a reporter for a major newspaper could believe that this happened (when it plainly didn't) and then note it so casually. What makes this item so particularly reckless in its absolute inaccuracy is that the link in the first paragraph is to this Washington Post article, which makes as clear as the English language permits that exactly the opposite happened ("The Supreme Court yesterday vacated a lower court's ruling that the president has the right to indefinitely detain a legal U.S. resident as a terrorism suspect, and put off a decision on one of the most expansive legal claims of the Bush administration"). As we all know, it's quite terrible how there are all these Internet blogs now that report things without any factual checks, unlike our nation's great establishment media outlets, which have multiple layers of editors and checks that prevent reckless, inaccurate and unreliable reporting. UPDATE: Anonymous Liberal, a lawyer who worked pro bono on the Al-Marri case (on the right side), says that while he, too, is disappointed in the lack of an ultimate adjudication here, he's "fairly confident that Obama's OLC reached the conclusion (and memorialized it in an official opinion) that the President did not have the power to detain al-Marri militarily." There is one criticism, however that I very much do agree with. It would indeed be far preferable if the Obama administration publicly renounced the detention power claimed by the Bush administration, rather than just refusing to assert it. They should release whatever internal opinions have been generated on this issue and let us know what their position really is. I see no justification for withholding that analysis from the public. I agree with that entirely. A.L. goes on to argue that "had that happened [i.e., had Obama told the Supreme Court he did not believe he possessed this detention power], it's still not clear that the Court would have ruled on the case." That's true -- it's not clear -- but why didn't the Obama DOJ at least state their position if that's really what it is? In fact, they did the opposite: they explicitly preserved the possibility that they would assert and exercise this power in the future ("Any future detention — were that hypothetical possibility ever to occur — would require new consideration under then-existing circumstances and procedure"). Even if the Supreme Court dismissed the case as moot, an explicit statement from the Obama administration -- and especially a formal ruling from the OLC -- rejecting the power asserted in this case would have been a substantial improvement over what they actually did here.